Madeline Singas, district attorney for Nassau County, will deliver the commencement address and be awarded an honorary Doctor of Laws at Hofstra Law’s Commencement Ceremony. Commencement will be held on Monday, May 22, at 7 p.m. at the David S. Mack Sports and Exhibition Complex, North Campus, Hofstra University. Upon taking office as acting district attorney in January 2015, Madeline Singas became the first Greek-American and the second woman to become the top law enforcement official of Nassau County. She was elected district attorney in November 2015 and took office for a four-year term in January 2016. Before her appointment as acting DA, Ms. Singas had served as chief assistant district attorney since 2011, supervising the prosecution of approximately 30,000 criminal cases each year and helping design and implement many groundbreaking programs. Earlier, she had served as chief of the Special Victims Bureau, a newly created position to which she was appointed in 2006 by District Attorney Kathleen Rice. Watch Ms. Singas receive her receive her honorary degree and deliver the commencement address on YouTube. Before Commencement, the Class of 2017 Graduates’ Celebration and Awards Ceremony will take place at 3 p.m. in the John Cranford Adams Playhouse. The program begins with an introduction and welcome by Judge A. Gail Prudenti, interim dean, followed by speeches by Student Bar Association President Dominic Delorantis, elected 3L Speaker Timothy Marsh and elected Teacher of the Year Professor J. Herbie DiFonzo. The ceremony continues with the presentation of various awards that recognize student accomplishments throughout law school. The students receiving awards will be notified via email on Friday, May 19. The program will last approximately one hour. Immediately following the celebration, a light reception will be served at the Law School, to which students’ family and friends are welcome. Tickets are not necessary for this event. Please note that students do not wear academic attire to this ceremony. The Commencement Ceremony will take place at 7 p.m. in the David S. Mack Sports and Exhibition Complex. The ceremony will last approximately two hours. 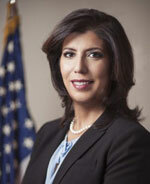 Madeline Singas, district attorney for Nassau County, will deliver the opening remarks. 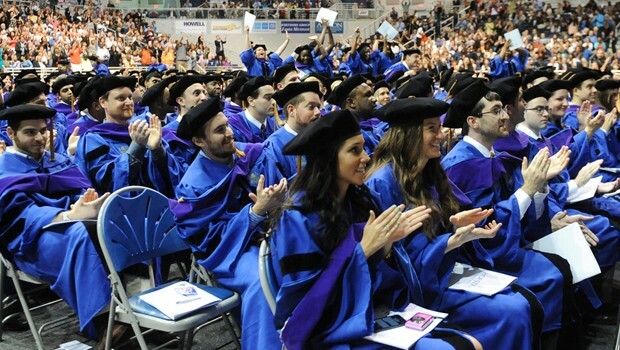 At the Commencement Ceremony, the president of the University, Stuart Rabinowitz, will confer the degrees, and students will walk across the stage to be announced by name, hooded and congratulated by Judge Prudenti. Tickets are not necessary for this event. Instructions regarding robing and assembly will be given to students when they pick up their academic attire. On the day of Commencement, students should line up in the Physical Education Complex at 6 p.m. The Physical Education Complex is located next to the Arena. Family and friends are free to enter the Arena and sit as they wait for the ceremony to begin. As students enter the Physical Education Complex, please stop by the table near the entrance to pick up a yellow index card. This card will have their name on it, as it is to be read when they walk across the stage. Please read the name carefully and make any necessary changes, and add a phonetic spelling of the name if needed. Once the processional lines are formed, students will walk into the Arena, and the ceremony will begin.